On Monday morning, the majority of news headlines read that an overwhelming number of Catalans voted for independence from Spain in the Nov. 9 simulated referendum. However, that is not the full picture. Preliminary results showed that 81% of 2.25 million Catalans who participated in the poll wanted autonomy from Spain. But those who came to the polls only count for about one-third of Catalans who are eligible to vote. 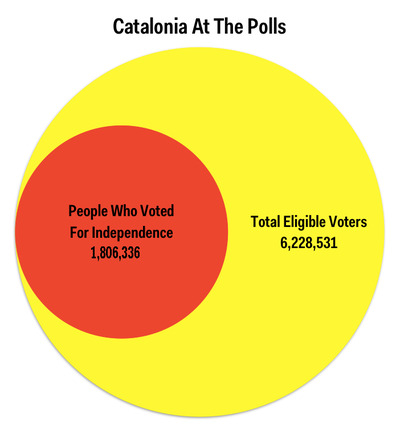 Catalonia counts about 7.5 million people. Of those, 5.4 million are Spanish citizens older than 16 and legally entitled to vote in the unofficial poll. There are about 900,000 residents without citizenship but still allowed to vote, and the total number of eligible voters comes out as 6,228,531 people, as indicated by the Spanish national statistics office INE. On Sunday, 2,236,806 people took part in the vote (although the number is set to rise slightly because some polls will still keep open for a few more days). Though it is a large minority of the electorate, it still means that only 35.9% of Catalans actually voted. Of the 2,236,806 people who came out to vote, 300,000 people voted against the proposition. That means 1,806,336 Catalans actively signalled their support for independence, which represents less than one Catalan out of three. 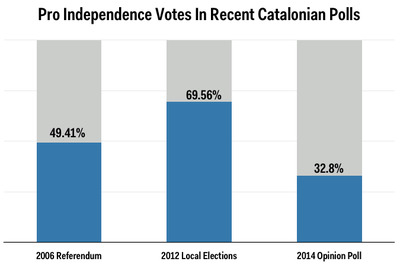 Given that the opinion poll was designed to show the strength of the pro-Independence camp, the results make sense. Those in favour of a split from Madrid had a strong incentive to head to the polls — if you were against independence, why bother to vote at all? Despite the fact that the regional president Artur Mas, the main political force behind the vote, hailed it as “a total success”, the fact that 66% of Catalans who had the power to vote did not bother doing so should be a concern. Spanish newspaper El Mundo wrote about “the majority that stayed at home,” saying that although many Catalans support greater local autonomy they didn’t want to take part in a political push for full secession. El Pais, another Spanish newspaper, compares the current vote to previous polls in the region: in 2006, a referendum on a devolution bill brought 49% of right holders to the polls, while 69% took part in the last local elections. As a comparison, in 1997 60% of Scottish registered voters took part in a devolution referendum in which 75% of voters supported greater autonomy. When a full independence referendum was called earlier this year, attracting 85% of eligible voters, the proposition was strongly refused (45%-55%). Given that an unofficial ballot is mostly about attracting attention, and lacks the actual upheaval of an actual split it is no surprise that separatists would be more inclined to go out and vote than those in favour of the status quo. In political jargon, it is called the silent majority. But the best result the Catalan government can now claim is that a significant minority of its electorate supports independence.